OSDev.org • View topic - Wrong code for testing the A20 line? Disable A20 in Bochs? Wrong code for testing the A20 line? Disable A20 in Bochs? Post subject: Wrong code for testing the A20 line? Disable A20 in Bochs? Before enabling the A20 with any of the methods described below it is better to test whether the A20 address line was already enabled by the BIOS. This can be achieved by comparing, at boot time in real mode, the bootsector identifier (0xAA55) located at address 0000:7DFE with the value 1 MiB higher which is at address FFFF:7E0E. When the two values are different it means that the A20 is already enabled otherwise if the values are identical it must be ruled out that this is not by mere chance. 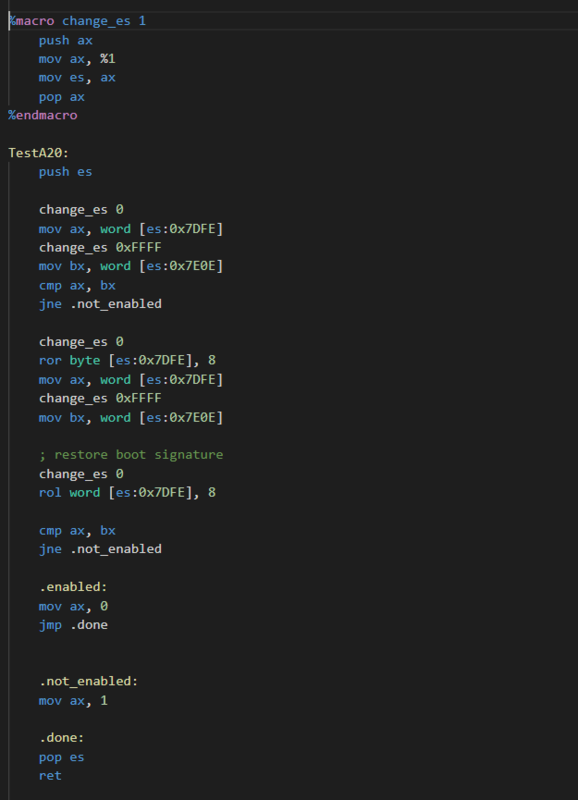 Therefore the bootsector identifier needs to be changed, for instance by rotating it left by 8 bits, and again compared to the 16 bits word at FFFF:7E0E. When they are still the same then the A20 address line is disabled otherwise it is enabled. First of all, I'd like to ask whether it's possible to disable A20 on Bochs. It depends on how your copy of Bochs was built. Support for the A20 gate is a compile-time option, so it may not be compiled into your copy of Bochs. Why is this an image? I don't think this instruction will do what you want. Well, I wouldn't know how it was built since I just used the Windows binaries on their website . But it's good to know that's a compile option. EDIT: Actually, I was just reading a log file and noticed this, indicating it is supported. But is disabling it supported? Regarding the ror instruction, may I ask why? Actually, I was just reading a log file and noticed this, indicating it is supported. But is disabling it supported? Yep. Wouldn't make much sense otherwise. You're rotating a byte by 8 bits. Oh, my God! Stupid me, my test function actually reported the A20 line to be disabled if the words at addresses 0x7DFE and 0xFFFF:0x7E0E (which translates to 0x107DFE) are DIFFERENT, which means exactly the opposite. THANK YOU SO MUCH! It works now.. the only thing I had to change were the two jumps: "jne .not_enabled" into "je .not_enabled". It reported it's NOT enabled, when in fact it was. This is without me touching A20 before running the test. Howerver, I was actually trying to disable A20 before running the test, which (because the test function was doing exactly the opposite) lead it to report that A20 was enabled and so the attempts of enabling it were skipped. Strangely enough, Bochs has the A20 line enabled by default, although I am using my own bootloader, not GRUB. Do you know why this happens? I actually remember encountering the same issue during my first attempt of writing an "OS". Also, I really laughed when I read the reason why you said my ror was wrong, haha! That should have been word.. lol, I was rotating an 8-bit value 8 times..
Strangely enough, Bochs has the A20 line enabled by default, although I am using my own bootloader, not GRUB. Do you know why this happens? It might be a good idea to check your bootloader in case it enables A20 and you've forgotten about it. I know I've forgotten most of what goes on in my bootloaders! Other than that, maybe Bochs has changed since the last time I messed with A20 in it? Although I think that would be considered a bug by the developers, since Bochs is supposed to emulate something resembling real hardware (from the mid-to-late 90s). I really can't see any such place in my code. I even tried checking with the code snippet provided on the OSDEV wiki A20 page, but it still reported the line as being enabled by default.